Written by @SimonCocking more at. Who are you, what’s your back ground? My name is Paul and I am the CEO of FETCH. I have been involved in logistics for over 5 years. I founded a shipping company while at University in Edinburgh called Uni Baggage, it is doing very well and ships to over 200 countries worldwide. I am now working on FETCH, a same day delivery app. I am from Belfast, N. Ireland. It is a fantastic place to run or start a business. Why are you planning to come to the Summit / what do you hope to get out of it? Our main aims are to raise awareness of FETCH in both the investor and tech community. We are in the process of building up contacts. The web summit is a fantastic place to do this. Is there anyone in particular you’d really like to meet at the summit? We will be mingling among other starts-up and I will be intrigued to hear their story, as for speakers Stripe’s John Collison and his brother have an inspirational story from Ireland, so I would love to hear him speak. Why Dublin, what do you think about Dublin relative to Belfast? Dublin has a huge start up and technology scene, Belfast is playing catch up, there is a lot going on in Belfast at the minute. Dublin offers a huge amount to businesses and I can see why many companies in Europe base themselves in Dublin. Dublin is only 2 hours down the road from Belfast so we are very close, we really should go down more often! FETCH. It is a same day delivery app, we are Uber for delivery. 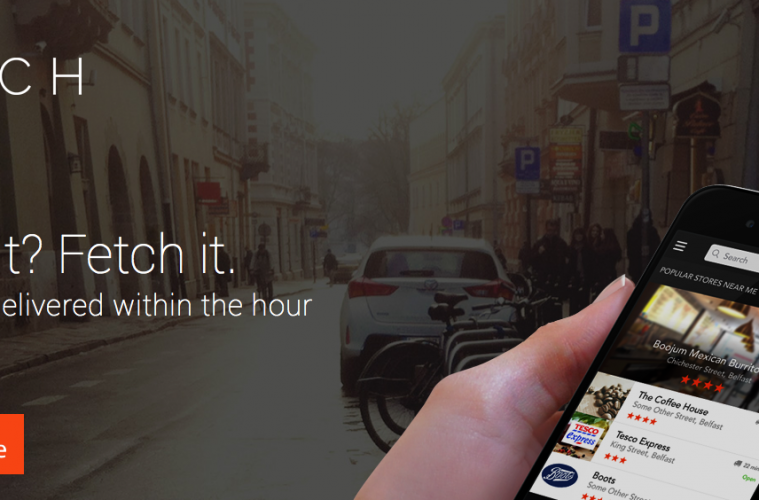 Users can order anything locally for delivery within an hour. Anything delivered within a hour! That is pretty awesome in itself. Where do you hope to be in 3 – 5 years time? We will be in London soon, which is our primary market, after that we will be looking for other densely populated European cities. We will be in at least 6 cities within the next 3-5 years. How is it trying to develop and scale a project and product in Belfast? Building a product in Belfast is awesome, scaling a product in Belfast, well, that is another kettle of fish. Belfast is a very small market and for a tech/online business to succeed in Northern Ireland you need to sell/export internationally. What is the broadband / wifi like? Fast enough for our needs. In certain party of the city and in the Northern Ireland Science Park there is super fast fiber optic broadband. Do you have any good workarounds for power outages or other local tech restraints? Yes we have a back up power and a 4G system for data and phones that we have actually needed a few times! We also have a fall over call center to handle customer support if anything goes wrong. Apart from being on an Island there is not that many local restraints that other cities don’t also face. Thanks a million for taking the time to talk with us. Hope the Summit goes well for you. Previous ArticleWhy is Ultimate Frisbee such a successful breeding ground for creatives and tech superstars?